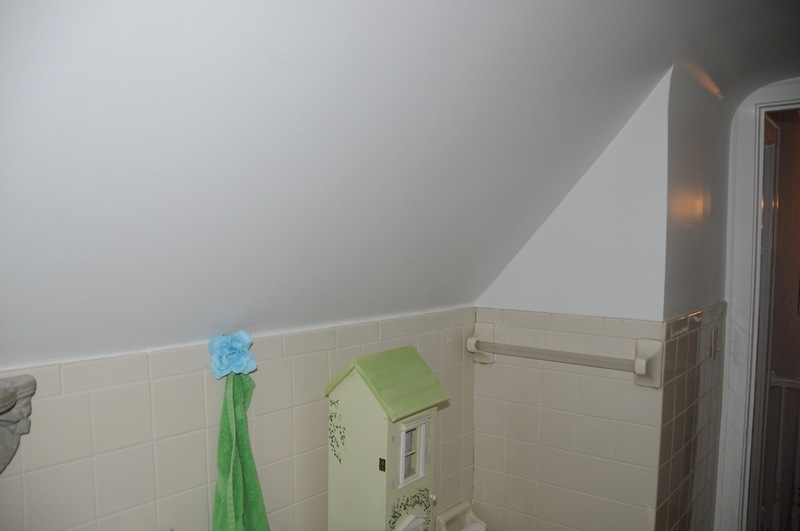 The first thing you'll notice is that this bathroom is tricky because the roof line cuts into the space dramatically, and the bath placement does not allow an adult of average height to stand upright without suffering a head injury. Second, notice how the old radiator crams the 36" vanity between it and the toilet. Finally, you can see how drab the bathroom appears since the last update 30 or 40 years ago. A linen closet behind the plumbing wall of the bathtub further shrinks the space. This was a bathroom in desperate need of new life, especially because it was the only full bath in this three bedroom home! Re-working the roof line was out of the question. Stealing space from the adjacent bedroom was also out of the question because the bedroom was already compact. What to do? We like to "go big" in a small bathroom; we like the outcome best when we stretch for maximum utility and memorable form. This bathroom was true to our approach with a blend of classic materials such as hex marble floor tile and chrome Grohe fixtures to modernize the space. Finally, some property therapy for everybody considering a bathroom renovation: remember you purchased this particular home for good reason, this bathroom has been on your to-do list for some time, and now this important part of your home is going to sparkle. It's a big deal, a frog-to-prince transformation, something to look forward to. Getting rid of all the frustration, disappointment, and other negative feelings is healthy. That's all the head-shrinking we can manage today ;) Back to demolition . . . There is something exciting about the challenge of a small bathroom. Limited square footage demands precision and an economy of form and function that is sometimes lost in the scale of large bathrooms. A small bathroom distills your plans. A nice overview of bathroom priorities was recently set out by Becky Harris at Houzz, and there is no shortage of good ideas there. Below are pictures of a recently completed small bathroom (6' x 8') attached to a bedroom. We think it contains the necessities: a vanity with storage, recessed medicine cabinet, toilet, and shower. The marble floor adds dimension and complements other features seen in the next photo.